This beautiful hat arrived very quickly, within a few days of ordering. It looks exactly like the photo, with a quality pompom. The internal lining makes this hat very warm, and it can be turned down to cover your ears, a helpful hint from another reviewer. I deducted 1 star as "one size does not fit all". I have long, thick textured hair which makes the fit a bit too snug, resulting in ribbed imprints in my forehead. I bring the internal lining down to avoid this. I love this hat! It’s gorgeous, great quality and looks amazing. I thought at first it seemed to expensive but it’s completely worth it, I wish I bought two at the same time, I need more! I get lots of compliments on the hat and it’s really warm to, I highly recommend it. Soft, luxurious knit. Color just as pictured. Love, love love this hat! Beautiful! 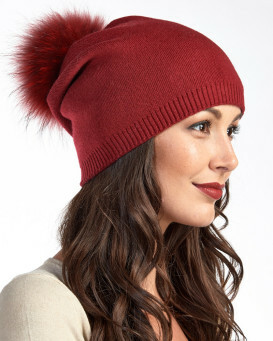 Great quality and gorgeous Pom Pom! It has been really cold here in Chicago and this hat not only is sooo cute but it keeps me warm! Very nice! Love the shape of it! This hat is stunning. I've had loads of compliments. The colour is gorgeous, it sits really well on the head and it is really thick and warm. The fur trim looks fabulous as well. Really pleased with this purchase.